At the first stop of the European leg of their Joshua Tree tour on Saturday, U2 was joined by former Oasis guitarist Noel Gallagher for a reindition of the Oasis classic, "Don't Look Back in Anger." Noel soon won't be the only Gallagher brother filling live venues with the sounds of Oasis. Noel Gallagher -- formally of Oasis, now of High Flying Birds -- will release a track from his collaboration with Amorphous Androgynous on March 12. Speaking to NME, Gallagher pointed out the he felt kind of a kinship with the late Nirvana frontman, citing their blue eyes and left-handedness. 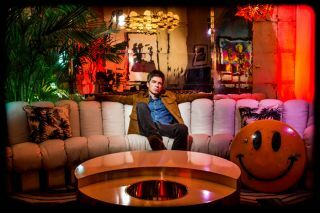 Noel Gallagher Streaming New Song, "Alone on the Rope"
Noel Gallagher is now streaming a brand new song, "Alone on the Rope," online. You can hear the track below.